To protect engines of damage the motor car manufacturer use checksums in their engine controllers. If you change the EPROM data, the cars run only in a protection mode of do not start anyway. Without the knowledge of that checksum a tuner cannot modify a modern engine controller. Tests of the motor software follows directly after the car is started. That gives us the chance to start the vehicle on the original software and switch to the optimized version after a short time. Our switching KEYs were developed for this aim. 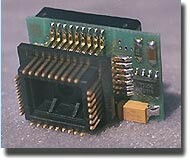 You must choose an EPROM of double size to program the original and modified version in one chip. The dimensions of the switching KEY are only 5 mm bigger (used for the switching electronic) like the ones of the normal modules. All VW TDI and DB Turbo diesel (no CDI) have got a 16- bit processor. Because of that they need two 8- bit EPROM's. Normally you only have to change the "HIGH"- EPROM and leave the "LOW"- EPROM original. Attention: Since 1998 there is no way to modify engine controllers with switching modules, because the control sum is checked during the use of the car.